All Nights Out take place from 5 to 7 p.m. at the Medical Center. Complimentary cocktails and hors d'oeuvres. Please RSVP to 305-367-6777. Keep Your Body in Full Swing! Learn the best course of care for aches and pains on Tuesday, Feb. 5, when Physiatrist Dr. Ronald Tolchin will host a Night Out at the Medical Center. Both men and women are welcome to attend Dr. Tolchin's two-hour presentation which will begin at 5 p.m. at the Medical Center. Dr. Tolchin, a Visiting Specialist at the Medical Center, specializes in spine-related disorders, sacroiliac joint dysfunction, rheumatologic and soft tissue disorders, scoliosis and osteopathic medicine. He received his Bachelor's degree at Philadelphia's Villanova University and his medical education at Nova Southeastern University's College of Osteopathic Medicine in Ft. Lauderdale. 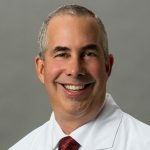 Currently he is Medical Director of Baptist Health South Florida's Center for Spine Care and has been named one of the Best Doctors in America since 2007. To learn more about Dr. Tolchin or to make an appointment, click here. If you've never heard of a physiatrist, it may be due to the fact that it's a fairly recent specialty. During World War II, physiatrists were asked to supervise the rehabilitation of U.S. soldiers returning home with severe musculoskeletal disabilities. Soon afterward, in 1947, the American Board of Medical Specialties formally approved physiatry as a medical specialty. All are welcome to attend Dr. Tolchin's presentation, but please RSVP to 305-367-6777 to reserve a space if you plan to attend. Cocktails and hors d'oeuvres will follow the presentation and you will have the opportunity to speak with Dr. Tolchin during a question and answer period. We look forward to seeing you there!